Whether I’m writing for my own blog or for clients, I don’t wake up the morning of a publication date and start writing whatever pops into my head. Far from it. Instead, I’m constantly compiling snippets of ideas and stashing them in my WordPress Editorial Calendar on proposed publish dates. Then, I try to write the post at least several days before the pub date. Here’s a look at the most recent post schedule — just below here, we’ve got about 6 weeks’ more posts tentatively mapped out, plus a cache of 20-some backup ideas that haven’t gotten a pub-date yet. You want to stockpile ideas and have tons of ’em, so that you can pick the hottest topic for each slot — and have more ideas ready, in case one idea doesn’t pan out as you’d hoped. Be aware of holidays, anniversaries, trends, and emerging issues on your topic, so you can write about them, as I did here with tips on how to survive the looming recession, after the stock market took a dive. Writing ahead also allows you to come back and polish your post ahead of the pub date, resulting in a stronger finished product. Understand that a key part of your job is to have terrific ideas, and lots of ’em. Spend time on idea generation. It’ll really pay off. And not just for your blog. It’s one of those writing tips that can help you land more freelance work, too. Eavesdrop on conversations, including ones on competing blogs. Ask your readers what they’d like to learn from you. See what questions are being asked (or maybe, are not being asked). Look for where your unique slant would provide something fresh. Do new interviews and research. Keep an idea sheet. My team has told me they’ve never seen a blog with so many ideas in the germ stage, waiting to become posts. That idea stockpile is the secret of making sure each post wows your audience — because you’re picking the best candidate from a long list of possibilities. Most new bloggers whose sites I’ve reviewed don’t understand the vital importance of their post headlines. Without writing a great headline, the rest of your work is a waste of time — because nobody’s going to read, share, or comment on that post. We seriously sometimes spend the better part of an hour writing and rewriting the headline, here at Make a Living Writing. I propose a hed, my editor Evan Jensen challenges it, or vice versa — he writes one, and then I start poking holes in it. Does it have key words to help readers find you? Is it fascinating and fresh-sounding? Is it too long or short? Keep massaging your headline until it sparkles. From my bucket of writing tips, I’d say this process is the top reason why this blog gets roughly 4,000 readers for each new post, the day it goes up. Writing blog posts one at a time isn’t efficient. That’s why I often sit down and write two or three posts back-to-back. In fact, I plan to write a second post right after I finish this one. Once you’re in the vibe of your (or your client’s) blog, it’s easier to stay there and keep churning out the words — as opposed to coming back a day or week later and trying to get back in that head space. Here’s a big problem in blogging: You get an idea, but you don’t have time to write it to completion right when the light bulb goes off. My solution is to free-write on the topic immediately. Take 5 minutes and jot down ideas. Get the gist written now, while you’re all fired up about this topic. When you come back, it’ll be easy to flesh it out from there. My heart always sinks when I see a topic idea I’ve stored, but no notes below it. Half the time, I can’t remember what I wanted to say! Great blog posts aren’t written in a rambling, random, creative-writing exercise mode — not written quickly and effectively, anyway. Great, quick posts are written to outlines. That’s why, when I do that free writing and am all fired up about an idea, I try to write subheads or bullets for the proposed post. 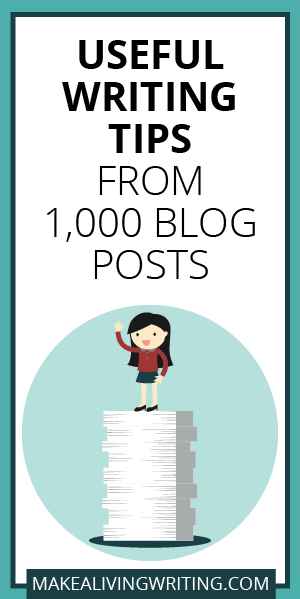 I did that when we first realized we needed this post, about hitting 1,000 blog posts. It’s so fast and easy to come back and simply fill in each subhed, compared with coming back later to map out the outline. With pre-outlining, all you need is an intro and conclusion and boom, done. Here’s another one of my writing tips. I learned this after realizing I was wasting time on this constantly: I would try to make myself write from first word to completed, final draft in one sitting. Nuts! Why? Because the next day, I would inevitably want to come back and polish it further. No matter how hard I worked on that first draft, I was never willing to accept it as my final. I’d put in another hour the next day, no matter what. The moral here is to know your writing habits, and work with them. I finally gave up this hopeless quest. Knowing I always want to tinker the next day, I started writing ‘spit drafts’ — very rough first drafts I banged out quickly, usually in an hour or less. Coming back the day after you write a first draft to polish it up is super-efficient. It’s amazing how the break gives you fresh eyes on your draft, and you can easily see where to cut fat, add details, or embellish with a creative adjective or two. Try to polish right after you write that first draft, and it’s a time-consuming agony. So write ahead, and give it a day! The single act that most commonly divides amateur blogs from pro ones is the presence of an editor. I don’t know how I did this without mine. If you can’t afford to hire someone, do a swap with another blogger and edit each others’ posts. Getting outside eyes you trust on your post — and taking their suggestions to heart — will help you improve your writing quickly. I hear from many writers who get burned out on writing blog posts. They stop writing their blog, or move on to writing other types of work for clients. The key is to keep evolving and changing your blog posts’ content, style, and approach. Vary the length. Make some posts include audio, screenshots, video, or infographics. Read widely, and bring in new influences and concepts. Introduce new features. Hold contests. Do Q&As. Keep iterating what you write, and you won’t get bored. As a bonus, neither will your readers. Even after publishing 1,000 blog posts on just this site, I don’t know everything about the business and craft of freelance writing. It’s a process of learning, taking action, and learning some more. If you want to get more from your blog, study best practices in blogging in general, and amongst your competitors, and keep changing it up. You’ll enjoy your blog post writing more, and be able to get it done faster. How do you quickly write blog posts? Let’s compare notes on Facebook or LinkedIn.